Walthard cell rests are benign clusters of epithelial cells resembling transitional cells (urothelium). They are most commonly found in the connective tissue of the fallopian tube but may also be seen in mesoovarium, mesosalpinx, and the ovarian hilum. They appear as small yellow-white or greyish nodules measuring upto 2 mm in size. The epithelial cells have elongated oval nuclei with longitudinal grooves (coffee bean nuclei). The larger clusters may become cystic. They are thought to be the site of origin of Brenner tumors of the ovary. The differential diagnosis includes: miliary tuberculosis (in endemic areas) and metastasis from malignancies of the gastrointestinal tract or female genital tract. 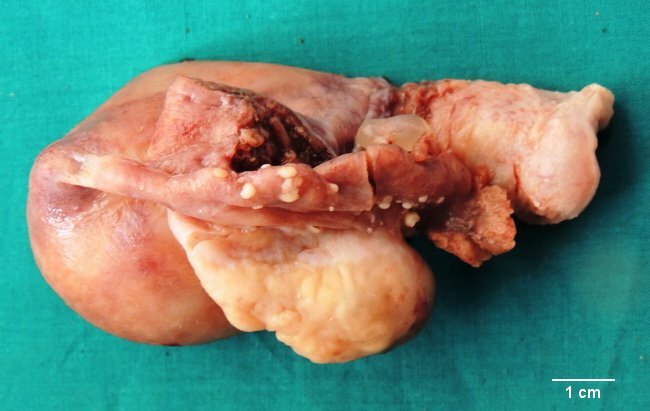 Case History: The image shows hysterectomy specimen from a middle-aged female with dysfunctional uterine bleeding. The serosal aspect of fallopian tube shows small round to oval greyish white nodules ranging in size from 0.5 to 2.0 mm. Microscopic examination showed characteristic features of Walthard cell rest. The larger lesions showed cystic change. Case courtesy of: Dr. Sanjay D. Deshmukh, Professor of Pathology, Dr. Vithalrao Vikhe Patil Medical College & Hospitals, Ahmednagar, India.